Every generation of marketers faces unique challenges. Today’s is identity, especially when it comes to connecting people’s online behaviors to their offline lives. Despite all the advances in digital technology, 90% of sales still happen in brick and mortar stores. So if you don’t get offline and online identity right, all your marketing will be wrong. Understanding the connectivity between offline and online identity is what takes marketing beyond understanding what a consumer does to reach a deeper level of understanding around who a consumer is. For example, online signals can tell you if a consumer has shopped for a luxury SUV online. But only offline markers can tell you if that consumer has an income that is likely to support the purchase, lives in a home (with a garage) or in a dense urban area where a compact electric vehicle or public transportation would make more sense. Without rich, relevant offline data to complement online actions, marketers are forced to target digital proxies instead of real people. What Is a Connected Customer Graph? A connected customer graph is the idea that a company’s data should allow for a complete, stable, but ever-evolving view of their customers across every touchpoint. 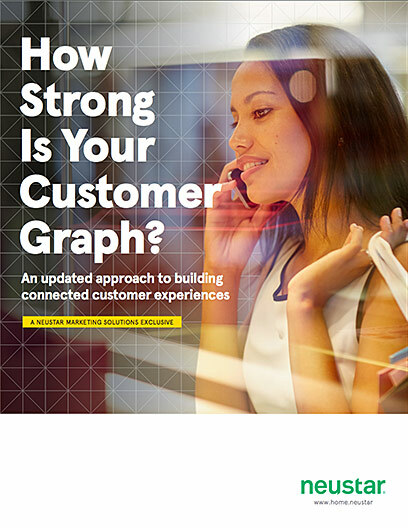 In addition to connecting first, second, and third party data, the connected customer graph needs to have the ability to connect online and offline behaviors. In other words, a customer graph is the framework by which a company determines what type of customer they’re interacting with, how they should interact with that customer, and how these interactions should vary across channels. This complex concept becomes clear when you think about examples that highlight the advantages of a connected customer graph over a more standard customer graph. Without a customer graph, a customer who makes a purchase on your website might be entered into your database as a separate customer than the one who made a purchase in your store. That same customer, when she calls your call center, will be treated as a new customer. And when you buy a list of addresses to attract new customers with mailer coupons, her address might be included even though she’s already made two purchases from you. Having a customer graph in place will help avoid some of these issues. The more touchpoints you’re able to interconnect in your customer graph, the better. Remember, there’s no such thing as a complete, final, or perfect customer graph. A marketer will never know everything there is to know about a customer or be able to keep up with all the reasons customers change their minds. These traits are necessary to help you understand what customer data matters to you, where to get it, and how to utilize it while keeping your customer at the center of everything you do. Ultimately, this allows marketers to leverage the connected customer graph to help reduce wasteful media spend, increase revenue, and meet financial goals. Digital-only customer graphs are great for online businesses. In general, it’s easy to tie a person’s online behavior to an online purchase. Cookies easily correlate presence on a website or social channel, a click on an ad, or recent searches to an online purchase. But businesses with both online and offline presences need ways to connect the two. An online ad might inspire you to stop at the store to ask a few questions and test out a new laptop, but you might still hop back online to make the final purchase. A connected customer graph understands that both the online ad and the offline experience influenced the eventual sale. Identity is who your customers are, not just what they do. For a long time, marketers focused on actions, not people. Online targeting consisted of re-targeting every website visitor you could get your hands on. Direct mail went out to a database of existing customers. Casual website visitors and serious purchasers were lumped into the same marketing bucket, and marketers spend millions on inefficient marketing campaigns that often ended up annoying rather than engaging the customer. Moving beyond this model requires grounding your data in a single, persistent, authoritative identifier that is used to corroborate data across all customer touch points. This identifier is how you understand that the click you earned belongs to a household who can afford your product and behaves (online and offline) like the people who tend to purchase your products. By getting identity right, the marketer also stands to unlock multiple customer engagement use-cases beyond acquisition marketing. Consider the implications in a call center, where purchase behavior or knowledge about recent life changes might give agents some insight into how to help a caller before they even start a conversation. Likewise, the ability to understand who a customer is can drive improved loyalty programs and other customer retention efforts. At the heart of every customer graph is the first-party data that a company owns about its own customers. Around this, you’ll want to layer data that expands the reach of your highly niche data. Marketers do this by purchasing third-party audience segments, or by sharing data with trusted partners. There are many ways to deepen your data pool, and we’ll discuss the benefits and pitfalls of each type of data later in this paper. First-party data is the information you own about your past and present customers. This is data is that is unique to every company, that no one else owns, and it therefore forms the foundation of most marketing efforts. Examples of first party data include customers’ names, addresses, phone numbers, website registration information, and customer loyalty program registration information. This information is highly valuable for many reasons. Most importantly, it is information about customers who have shown interest in your product—real people, not modeled audiences. This group represents an accurate sample of your ideal target audience, and can be augmented to find lookalikes. And because you are in charge of collecting your own data, you can choose to include information that matters to your business (gender if you sell clothing, urbanicity if you sell off-road vehicles, number of children if you sell baby food). There are several ways to collect first-party data. The most common is through a CRM, but you can also learn a lot about your customers by looking at your website analytics, the transaction history of your ecommerce site, or social media analytics. However you’re able to learn about your customers, it’s important to onboard it with a trusted partner so that you can use it for digital marketing. The right onboarding partner will be able to deliver not just a higher match rate, but also the ability to amplify your audience by building lookalike audiences that increase scale without sacrificing precision. In a nutshell, second-party data is someone else’s first party data. Previously regarded as a bit of a mystery, second-party data is quickly emerging as a marketer’s secret weapon. It offers marketers the ability to reach customers at greater scale while maintaining control over the type of customer they’re trying to reach (in other words, it’s still much more precise than third party data). So, where does second-party data come from? You can buy it from an aggregator or you can look to your distribution and channel partners for data sharing candidates. When looking for someone to share data with, marketers usually look at companies that are complementary, but not directly competitive. An intuitive example is a tire manufacturer partnering with a car dealership to share customer data. It makes sense that a person who owns a car would need tires, and that a tire company would want to market to car buyers. If finding and building partnerships for the sake of obtaining second-party data seems like a lot of work, that’s because it is. But increasingly, data co-ops are becoming available for companies that want to share data without making it available for third-party audience syndication. Second-party data is higher quality, and comes from trusted partners that require less vetting. And since you’re ideally partnering with customers who are chasing the same customers as you, second-party data partnerships can be a smart way to get more information about your customers and extend your reach in a relatively sophisticated way. Third-party data encompasses the broad range of pre-packaged, segmented audiences that can be purchased from data providers and syndicated for targeting purposes. Marketers who want to target broad or commonly available segments like “Women over 60” or “Buys Ice Cream” have many choices when it comes to buying third-party data. Third-party data can be incredibly useful for audience extension, especially if you take steps to ensure data quality. It’s critical to review the sources of data. That means asking how the data is collected, how often it’s refreshed, and whether it’s tied to offline, real-world indicators. Marketers need a customer graph that helps them understand the interplay between customers’ online and offline worlds. If you don’t have one, start building one now. If you already have one, make sure it’s robust, connected, complete, corroborated, and refreshed over time. Remember, the customer graph is an ever-evolving framework for understanding your customers’ experience, not a project you tackle once and are done with. Your Customer Graph should help you understand who you want to target, how to reach them across devices, screens, and offline experiences. Once you know that, you’ll be better able to deliver connected customer experiences across the value chain.